Genus of about 45 species of deciduous, semi-evergreen trees occurring in woodland, thickets and hedgerows in Northern temperate regions. Ulmus have alternate, ovate to elliptic toothed leaves usually with very unequally sized bases. Most species display good fall colour. Ulmus species and in particular Ulmus parvifolia/Chinese Elm are often confused with Zelkova species, in particular Zelkova serrata/Japanese Elm. Zelkova are classed as a seperate genus to Ulmus as they have fruits that are unwinged as opposed to the winged friuts of Ulmus. Zelkova also differ in that they have single-toothed leaves whereas Ulmus have double-toothed leaves. (Zelkova are listed under their own species guide). 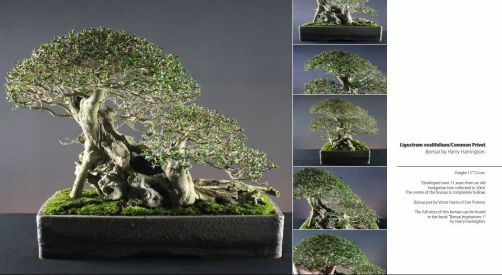 The most common Ulmus species used for bonsai is the Chinese Elm /Ulmus parvifolia, however there is no reason why any of the many Ulmus species cannot be used. 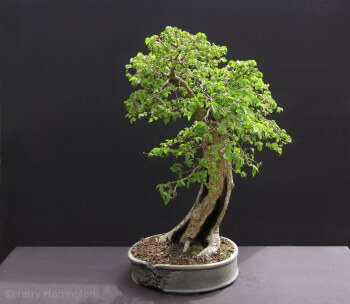 Ulmus parvifolia/Chinese Elm are often sold as indoor bonsai and as such are acclimatised to indoor growing conditions, however Chinese Elms are temperate trees and fully frost hardy. Chinese Elms grown indoors (or in climates with very mild winters) will remain evergreen whereas outdoor cultivation results in a deciduous tree. I am reliably informed that given protection from cold winds and mulching of the pot with straw, soil or bark, Chinese Elm bonsai will actually cope with temperatures of -10°F. (Zone 6 Winters). Chinese Elms planted in the ground will survive in zone 5 Winters; that's temperatures down to -20°F (-28°C). (Indoors) Well lit, cool position on a sunny windowsill during the winter. Keep up humidity levels. Place outside from May onwards after last frosts have finished. Try to keep outside until Autumn when the leaves can be allowed to fall naturally before bringing indoors. (outdoors) Outdoor elms/acclimatised elms are fully hardy to frost though freezing winds can result in fine branches dying back if left fully exposed. (indoors) Never allow compost to dry out, keep the compost evenly moist. Check the compost daily but only water when necessary. Watering daily as a routine results in sodden compost, leading to lack of vigour, rootrot and eventually death. (outdoors) As with indoor watering though during periods of strong sun, high temperatures or strong growth in the Spring, trees can need far more frequent watering. (indoors) Balanced feed weekly through Spring and Summer. Monthly through the winter. Do not feed when out of leaf. (outdoors) Once buds open in Spring, feed weekly with high nitrogen for first month then every two weeks until late summer with balanced feed. Repotting In Spring as buds extend annually. Elms have very strong and vigorous rootsystems that need annual rootpruning. Rootbound Elms will grow poorly. Trees overwintered indoors can be repotted in Autumn after leafdrop but before being brought inside. Repot in basic soil mix. One of the main attractions of Elms is the great contrast that can be achieved between a thick trunk and the delicacy of very fine growth at the tips of the branches. Allow shoots to extend 3 or 4 nodes then prune back to 1 or 2 leaves as required. Pruning of large branches during the Spring and Summer can cause heavy calluses; if necessary, the size of the scar can be reduced by carrying out major pruning work in late Summer and Autumn. Wiring In mid-summer though indoor trees can be wired mid-winter particularly if out of leaf. Care should be taken as bark marks easily. Healthy trees can also be defoliated during Winter (if necessary) and mid Summer to enable easier wiring. Propagation Sow seed outdoors in Autumn or Spring. Greenwood cuttings in Summer. Hardwood cuttings in Winter. Air-layering after spring growth has hardened. Pests and diseases Elm bonsai are not affected by Dutch Elm Disease as the beetle requires the volume of wood only available to it in fully grown mature trees. An attack (if it were to happen) would easily be dealt with by systemic insecticides and fungicides on a potted tree in comparison to the problems associated with eradicating Dutch Elm Disease on a fully-grown tree in the ground. Styles Suitable for all forms and sizes- especially good for the broom form which replicates the natural shape of Ulmus.